What is involved in installation of a CV system? When do I use a 90 short el vs. a 90 sweep el? How many sq. ft. will one valve cover? How many inlets does my home need? How high do I mount the inlet valves? Do I need a valve in every room? How do I get the tubing in the walls on a retrofit? Do I need to order a muffler for each unit? Is a “Motor Protection Valve” or “Suction Relief Valve” needed with my vacuum system? What are Tangential Bypass and Thru-Flo motors? What is the “Manufacturers Suggested” SQFT Rating? Does an electrician need to install the Supervalves (direct connect)? Do I need a license or permit to install a CVS in my new construction home? How long does it take to install the central vacuum system? Must I use the same brand attachment kit as my power unit? Which Power Units is best for me? Which attachment kit is best for me? What is a central vacuum “Hose Management” system? Why is your price so much lower than the local guy? What is involved in installation of a central vacuum system? run. Power Units should not be installed in a small confined area or heat producing area. installed beginning with the inlet valve farthest from the unit. Each valve will use approximately 20′ of tubing. Always allow for placement of power unit. likely get caught in the short el, preventing the system from a potential clog. Vacdepot includes only 1 short ell for each inlet in the kit and 1 extra for backup. How many Square Feet (sqft) will one valve cover? with a 30ft hose or 960sqft with a 35′ hose when a valve is mounted in the exact center of the room, using the formula..
Those of us with mostly square walls, hallways, cabinets, doors and furniture will more likely find coverage of a 30 foot hose is about 500 square feet of interior space. A 35 foot hose could increase your coverage to 550 or more square feet per inlet, though it also adds 14% more hose/airflow resistance and more hose to carry around and store. Planning an installation is best done with a 30 foot hose, figuring some less (about 3ft.) for rise and fall from inlet to grip. Coverage is often more determined by inlet placement then all other factors. Keep in mind that inlets are inexpensive (especially for DIY installs) and easy to add to a new system. It is better to have one to many inlets than to come up short in cleaning reach or require the unplanned use of a 35′ hose. You can work from your scale plans using a piece of string cut to scale for the 30ft hose to help you determine placement. When it comes time for the install it’s best to check your plans with a tape measure or 30ft long piece of rope on site. Attach your rope or tape to the wall stud where you plan to install the inlet and make sure you can reach all the areas necessary for each inlet. You should have overlapping coverage and make allowances of furniture and built-ins. Don’t forget to cover the garage and porch areas! This is mostly a personal preference, though inlet valves are typically installed at the same height as electrical receptacles. No. 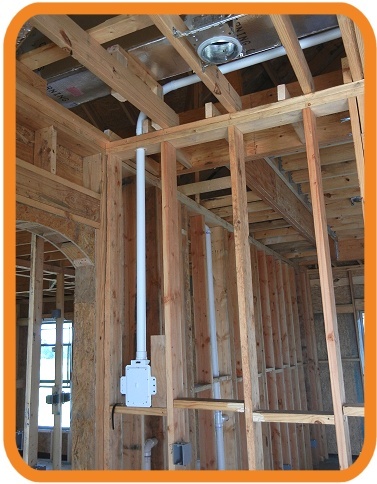 With proper planning, one valve will usually cover two or three rooms. Do systems need to be exhausted outside? Only fully cyclonic (“filterless”) vacuums require an exhaust as they vent particulate. Somewhere in the range of 5% – 10% of what you vacuum in a fully cyclonic powered system is vented through the exhaust and that should terminate outside the home. All other filter types of central vacuums have internal filters and do not require an exterior exhaust. Aspria Systems does not manufacture cyclonic filter vacuums. Most central vacuum units are fitted with connections to vent the exhaust and our general recommendation is if it can be done easily and with a short run of tube then it is a very good idea, particularly for basement or utility closet installations. For those units in a regular garage it might be less important. Exhaust tubing runs can have a negative impact on system performance and should not exceed 25ft for any model or brand. Shorter is always better in exhaust runs. You should not vent into your attic. This defeats the purpose of removing the particulate, odors and heat from your home. Benefits of exhausting to the exterior are far less noise at the power unit location, complete ventilation of all particles – even those sub micron particles that are not captured by the vacuum filter and finally less heat generated at the location of the power unit. to the farthest inlet valve. location. Tubing can be inserted between the studs from either location. Some retrofit installations run the trunk in an attic and come down into the house inside a closet. The pipe is run inside a closet wall and then “poked” through the walls to reach the room where you want the inlet. Mufflers work best when outside venting in not possible. Consider adding a muffler if your installation can not be vented outside, is mounted on a wall very close to living space or mounted in a space that may be occupied (basement, mudroom, etc). Also check your power unit specifications as most units of the low-noise type include a muffler from the factory. No. For the vast majority of CVS owners these devices are a bad idea. Most central vacuums use a tangential bypass motor in which the working air (the air you vacuum inside your home) is pulled through the fan system and exhausted through a port in the vacuum motor and outside – if so equipped with an exhausting pipe system. This working air does not cool the motor. Instead a second cooling fan on top of the motor pulls air from around the power unit for motor cooling. That’s the reason for vents/slots on top and side of the motor housing of a CVS unit. While there are motors that use working air for cooling (aka Thru-Flo Motors, see below), they are somewhat rare in CVS power units. The second assumption in the marketing of this suction relief valve is that central vacuums clog often, or that they clog at all. Many people that have always used under powered or inferior designs of portable upright or canister vacuum which clog easily assume the same is true of central vacuums when it is not. Many CVS owners will report never having a clog issue with 25+ years of use. Lastly, “suction relief” valves do just that – relieve your system of it suction when it is not necessary or harmful. Many of these devices are adapted from other uses and are unreliable which makes cleaning with a CVS inconvenient. If a suction relief valve was needed in a central vacuum power unit you can be sure that the CVS manufacturers would build it right into the unit (and charge you for it!). Instead manufacturers use a more reliable thermal reset that shuts the motor down if overheating occurs. armature and stator (motors winding), the armature spins and the stator is stationary. Tangential bypass uses a series of impellers (fans) and shrouds to pull airflow through the motor and a special exhaust duct (called an exhaust horn) to port the exhaust out of the motor. The entire fan/shroud/horn assembly is separate from but connected to the motor. This design is widely accepted as the superior system for it’s efficiency and reliability. Tangential bypass motors in floorcare are used only in central vacuum power units, never in portable vacuums. Tangential bypass motors are often used in one of two sizes for central vacuums, 5.7″ or 7.2″ diameter and may have a series of one, two or three impeller (fan) blades referred to as motor stages. Bypass vacuum motors often have a lifespan of 15 – 25 years with little maintenance. Like all good things the tangential bypass vacuum motor does have one downside; they cost more. All Aspria central vacuum power units use bypass vacuum motors. It’s one of the many reasons that Aspria vacuum systems are so great. due to clogging, dirty filter or faulty airflow regulation. Thru-flo motors do not allow for a ducted exhaust and CV power units using thru-flo motors must either self-vent or seal the entire motor & electronics compartment to force the exhausting air through an external port which may lead to dust leakage and premature electronics failure from dust build-up. Thru-flo motors have two primary advantages for central vacuum power unit applications; they are smaller than tangential bypass and much less expensive. This makes thru-flo motors best suited to special compact design models and “builders quality” models. Thru-flo motors are used in some models of MD Manufacturing power units and many models of Drainvac and Purvac brands and some models of the Vacumaid Astro-Vac series. may retain heat and cause the motor to experience premature failure. An attic location may also be difficult to reach when the dirt canister needs emptied. What is the Manufacturers Suggested SQFT Rating? Manufacturers offer a square foot rating with each of their power units to provide assistance in choosing the right power unit for the application. The suggested sqft rating is often worded as “designed for homes up to 8,000 sqft”. The suggested rating can vary a great deal from model to model and from one brand to another and take into account many factors including motor performance and design, capacity and filter type. Often the “upto” number is more of a theoretical maximum. Real world installations rarely come close to the designs used to calculate the maximum suggested square footage, even on the highest quality installation by a professional. With a CVS power unit installed in an application at the maximum end of the manufacturers suggested square footage the resulting performance may only be sufficient at best or likely it would be lacking in power. To achieve performance cleaning in your application most CV equipment dealers will double the actual square footage and apply it against the manufacturers recommended maximum. For example; if your home is 3100sqft you would want to find a model with a manufacturers suggest rating of upto 6200sqft or more. If you application is replacing a much older system (20 – 30 years), used with a tube system that is smaller than the standard 2″ (some older systems) or you are at best “concerned” about the quality or efficiency of the installation you would likely want to use a factor of 2.5 or 3.0 to ensure adequate performance for the conditions. Those installing a Hide-A-Hose system follow another set of standards for power unit performance based on the final installation of the inlets and hoses. It is hard to have ‘too much power’ for cleaning, and the negatives of too much suction are inconsequential for most users. Install a system with too little power and what should have been an added convenience will only provide you added frustration from the lack of ability and potentially an added tendency to clog due to lack of airflow. Does an electrician need to install the Supervalves or ElectraValve (direct connect)? In most instances, an installer can install standard valves, vacpans and the low voltage portion of the direct connect style (super) valves. Each SuperValve has a box for connecting the 110v wire that will need hard wired into the electrical system by an certified electrician. a clog. Aspria offers both Vacuum Tube systems and SCHD40 tube systems. You can read more in our related article Totally Tubular. At the time of this article we know of no state, city or town that requires a special license or permit for the self-install in new construction though it might be a good idea to check with your contractor. As of January 1, 2006 a specification for the materials used to install a CVS system and intra-system fittings (all fittings from the back of the mounting plate to the power unit including tubing, tee’s, wye’s, ell’s and couplings) must be marked with the ASTM F2158 standard as well as the IAMPO UMC logo. If your area is covered by the Uniform Mechanical Code (UMC) then use of unmarked fittings may result in a failed inspection which may require replacement of the installed fittings. All Aspria Systems fittings conform to the standards and are marked accordingly. All electric inlets sold by Aspria Systems are UL listed or approved. Most new home installations can be complete in less than one day. A typical 3 inlet pre-existing install may require a weekend for two people to complete. No. All attachment kits we sell are universal and will work with all brands of power units we offer. Our attachment kits will also work with most all pre-existing systems on the market, even older ones. Some systems from Kenmore, Vacuflo and Nutone (pre 1995) may require adapters or new inlets to be installed. If you have any questions about upgrading your system with a new attachment kit contact us</>. The model of power unit you choose should be based on the size of your home, the types of floors you will be cleaning and the method of filtration you desire. Use the manufacturers square footage guides as a general recommendation to start, then compare suction and airflow (or air watts, a total number of suction and airflow). Always take into consideration the filtration method, collection bin capacity and the cleaning load you will need to cover. For example a 2,000 sqft installation of 50/50 hard floors & carpeting with 2 adults will require less cleaning power than 2,000 sqft of 20/80 hard floors & carpeting with 2 adults, 2 children and 2 pets in the home. Stronger CVS power units will offer longer and more consistent cleaning performance in highly loaded homes, and will also require less maintenance. The model of attachment kit will vary by the type of flooring you intend to clean with your central vacuum. Straight suction and Turbo kits are for hard floors and homes with only area or throw rugs. For cleaning homes with installed carpets the use of a Powered Brush system is recommended. The brand and quality of the attachment set is best determined by the size of the area being cleaned. While most any quality or brand power brush might be appropriate for a 1200 sqft installation with carpeted bedrooms and hard floor living areas, many lesser quality power brush attachment kits would not be appropriate for a 3,500 sqft installation of mostly carpeting with pets and children in the home where it will receive considerably more usage. Many have seen the Hose Management systems at builder or home shows, model homes and builder show rooms. The most popular system is the Hide-A-Hose central vacuum systems. This design uses suction from the vacuum to recover the hose when you finish cleaning and store it within the tubing system. Hide-A-Hose is easy to install, easy to use and very effective. Vacdepot is an Authorized Hide-A-Hose dealer and offers all colors and models of the Hide-A-Hose system for homeowners, DIY installers, builders or anyone needing a complete hose management system. Contact us for more information about the Hide-A-Hose brand hose management systems. Why is your price less than the local guy? The Aspria Systems you find online is not a traditional retailer but more a specialized manufacturer which is dedicated to online customers and we are competitive with others in our online marketplace. Unlike most online retailers we purchase large volumes of raw materials to lower our selling cost and stay competitive. Most local vacuum dealers buy in very small volumes (sometimes as needed per customer) which comes with a higher cost, results in a higher selling price and smaller selection. Most of our online competitors do not actually purchase and resell all of the items they offer but simply drop-ship their customers orders from their manufacturer partners. Aspria Systems never drop-ships our customers orders. Perhaps the bigger reason for the difference in pricing of local dealers and Aspria Systems are the markets and customers we both serve. Aspria Systems serves more customers that are ready to DIY, including professional installers, home builders and their sub contractors. In most cases the customer ordering products online has a good idea of what they want or knows how to go about finding what it is they need. A local dealer is great for the customer that is not ready or willing to do it themselves. If you need the hands-on assistance of the local dealer then the higher price could well be a bargain. Aspria Systems is ready to help you do-it-yourself and save you some money, but if you are not comfortable with DIY then get in touch with your local dealer and compensate them for the service they provide. ← WHICH CENTRAL VACUUM IS THE BEST?